CompanionLink will be at Sage Summit 2011 in Washington D.C. from July 10th to July 13th. If you are planning on attending, be sure to swing by booth #164 to say hi to Rushang and myself! We’ll have some of the latest iOS and Android devices on hand to demonstrate how our mobile app, DejaOffice, brings business-class functions to these devices. ACT! has been on of the most consistent products we have worked with at CompanionLink. We‘re looking forward to catching up with many ACT! users and consultants at the Summit. Hopefully we’ll see you there! Even if you aren’t attending Sage Summit this year, I encourage you to watch for updates from the road on our Twitter and Facebook pages. We’ll share our thoughts and comments from the show floor, so be sure to follow along! SugarCRM is an open-source CRM package that has quickly been rising in popularity due to its flexibility, availability, and community support. The company recently celebrated a year of tremendous growth – they claim that they are now the fastest-growing CRM solution available. CompanionLink has had a long history of synchronizing with a wide range of popular CRM platforms, and we are pleased to announce that we now support sync with SugarCRM. CompanionLink can sync SugarCRM contacts, calendars, and tasks direct with Android, iPhone, iPad, BlackBerry, and more. We can also sync SugarCRM with Google, or with other PC-based contact managers like Microsoft Outlook. HP officially releases their first webOS tablet tomorrow, the HP TouchPad. 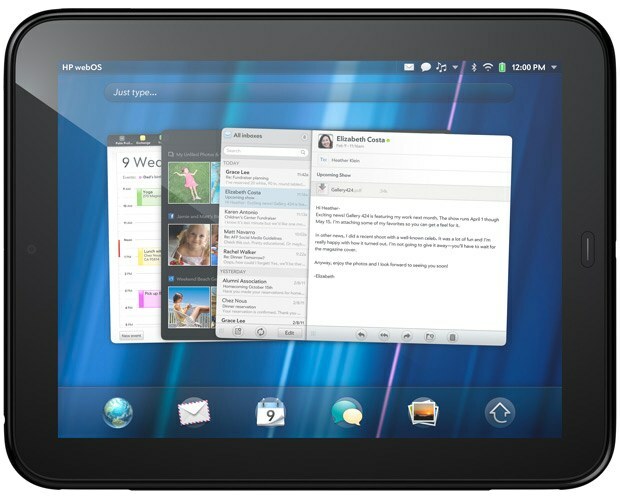 HP has optimized the webOS platform, bringing its famous “card based” interface to the tablet. The TouchPad comes in two flavors: 16GB for $499 and 32GB for $599. Both models feature a 9.7” screen, dual-core 1.2GHz processor, front-facing camera, and much more. Check out all the tech specs here. Of course, the most common question we’re getting about the TouchPad is “How can I sync the TouchPad with Outlook,” or any of the popular CRM tools, for that matter. At this point, we expect CompanionLink’s current webOS solution to work seamlessly with the TouchPad – that is, to sync via Google. Of course, we will be testing our software with the TouchPad once we are able to get one in the office. I’ll be sure to post an update once we have tested syncing with the TouchPad! In the meantime, who’s planning on getting one? Update: USB sync is now live for all webOS devices, including the TouchPad! Read about it here. Over 800 people gathered last Thursday for the Portland Business Journal’s 100 Fastest-Growing Private Companies event, held at the Portland Art Museum. We were thrilled to be among them, knowing that CompanionLink had made the list, somewhere among the top 100 companies. As the Portland Business Journal counted down from 100, we waited with anticipation to see where we ranked. As we listened for our name, more and more companies were recognized for their stellar year over year growth. 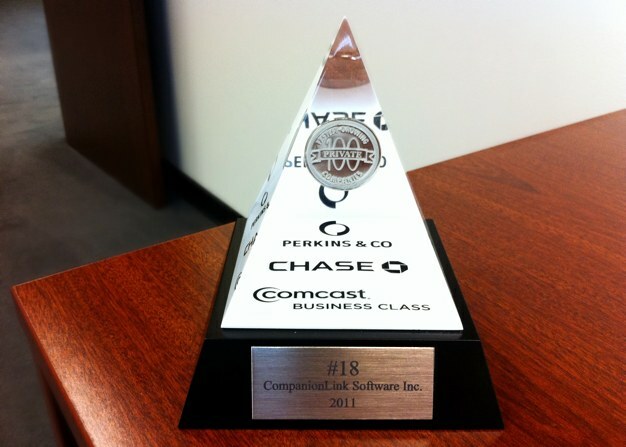 The announcer finally arrived at CompanionLink Software – the 18th fastest-growing private company in Portland! We are very grateful to have achieved this status, and we couldn’t have done it without you – our customers. Thank you for your support! Which Sync Method Is Best? This post will help you understand the differences between the four sync methods that CompanionLink offers you: Direct USB Sync, Local WiFi Sync, Secure Hosted Wireless Sync, and Sync via Google. Below, I’ll explain each one to help you find the best sync method for your setup. Simply dock your phone to your PC and sync. Set it up once, then enjoy the convenience of a wireless sync. Wireless sync – no cords! *Automatic sync is currently Android-only. iOS users must initiate the sync on the PC. Secure Hosted Sync works in conjunction with our free Android and iOS app, DejaOffice (or DejaLink for BlackBerry users). *Currently Android-only. Coming soon on iOS, as well as for Zoho and SugarCRM. For more information on how to sync your device with your Google account, visit google.com/sync. *Google imposes certain limitations on the type of data we can sync. As such, we do not recommend Sync via Google for those with more complex databases. I’m happy to share that we’ve passed 100,000 active installs of DejaOffice! That means that amongst you, our customers, there are over 100,000 Android phones & tablets, iPhones, iPads, and iPod Touches all over the world currently being enhanced by DejaOffice’s business-class productivity features. All this in just a little over one year, too! 2011 has already been an exciting year for DejaOffice. We’ve added dozens of new features and enhancements, from widgets to global search to grouping, and much more. But we’re not stopping there. We have even more great features planned. While I can’t get into the details just yet, I can tell you that 2011 will continue to be a very exciting year for DejaOffice. Stay tuned! Just a quick update today to announce the brand new DejaOffice.com! We have completely redesigned the site so that it is easier than ever to learn about all of the great features in DejaOffice. I encourage you to head over to www.dejaoffice.com and check it out. We’d love to hear what you think! Share your feedback in the comments below. Hate Duplicates? We Do Too. Duplicates. Perhaps the most despised sync issue that could arise. There are few things as annoying and damaging to your productivity as seeing 5 copies of your data. 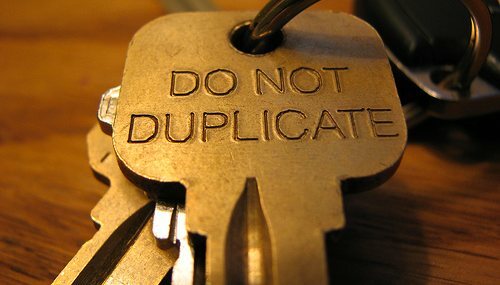 At CompanionLink, we have worked hard to eliminate data duplication. With over 15 years in the business, we’ve learned a lot. But even the best sync solutions are prone to error. This is due to the fact that they must rely on a computer to make the final decision. The computer simply cannot know if the “John Smith” with just an email is the same as the “John Smith” with just a phone number. In our own software, we’ve learned that if a user experiences data duplication, it is almost always a result of an incomplete setup. To that end, we have created a resource that quickly informs you how to achieve a proper sync setup. Head over to our Sync 101 page for the 3 easy steps that will help you avoid data duplication and save your productivity (and sanity!). 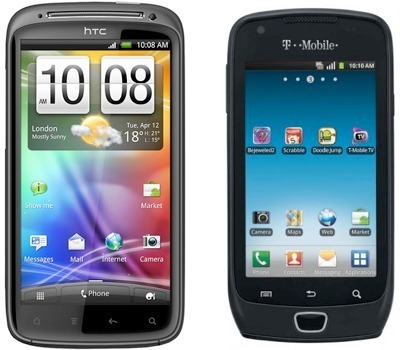 Today I wanted to talk about two upcoming Android phones: the HTC Sensation and Samsung Exhibit 4G. They are two very different phones and at CompanionLink we’re excited to see them released to two very different reasons. The HTC Sensation looks like it will be just that – a sensation. With 4G speeds, the latest version of HTC Sense, a dual-core 1.2GHz processor, 4.3” display, 8-mexapixel HD camera, and more, the Sensation is poised to be one of the top Android phones releasing this summer. And at $199 it is priced to compete. We have yet to try one out ourselves, but from everything we’ve seen this will be the phone to get for those looking for a powerful Android experience. Look for it in Walmart stores June 12th and T-Mobile locations by June 15th. That said, not everyone wants to spend $199 on a new phone. That’s where Samsung Exhibit 4G comes in. Providing a solid Android experience atop a 1Ghz processor handset, the Exhibit 4G should prove to be a popular phone among those looking for an entry-level smartphone. While it may not be the most powerful Android phone available, it packs plenty of features to satisfy the casual user’s needs. And at just $79, it’s priced to move. T-Mobile has yet to provide a set release date, but has promised we will see the Exhibit 4G this June. Whether you’re looking for the latest, powerful Android handset or are hunting for a feature-rich phone at a great price, you’re sure to find something you’ll love soon. And, of course, with DejaOffice and CompanionLink you’ll be as productive as ever on your new phone! Once released, we’ll be testing these phones to ensure they work as expected with DejaOffice and CompanionLink, but at this point we don’t foresee any issues.